We evaluated the ratio of jobs to workers from Smart Card Data at the transit station level in Beijing. A year-to-year evolutionary analysis of job to worker ratios was conducted at the transit station level. We classify general cases of steepening and flattening job-worker dynamics. The paper finds that only temporary balance appears around a few stations in Beijing. Job-worker ratios tend to be steepening rather than flattening from 2011 to 2015. As a megacity, Beijing has experienced traffic congestion, unaffordable housing issues and jobs-housing imbalance. Recent decades have seen policies and projects aiming at decentralizing urban structure and job-worker patterns, such as subway network expansion, the suburbanization of housing and firms. But it is unclear whether these changes produced a more balanced spatial configuration of jobs and workers. To answer this question, this paper evaluated the ratio of jobs to workers from Smart Card Data at the transit station level and offered a longitudinal study for regular transit commuters. 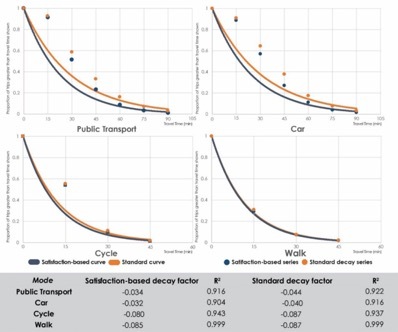 The method identifies the most preferred station around each commuter’s workpalce and home location from individual smart datasets according to their travel regularity, then the amounts of jobs and workers around each station are estimated. A year-to-year evolution of job to worker ratios at the station level is conducted. We classify general cases of steepening and flattening job-worker dynamics, and they can be used in the study of other cities. The paper finds that (1) only temporary balance appears around a few stations; (2) job-worker ratios tend to be steepening rather than flattening, influencing commute patterns; (3) the polycentric configuration of Beijing can be seen from the spatial pattern of job centers identified. This study examines the dependency between traffic links using a three-dimensional data detrending algorithm to build a network weight matrix in a real-world example. The network weight matrix reveals how links are spatially dependent in a complex network and detects the competitive and complementary nature of traffic links. We model the traffic flow of 140 traffic links in a sub-network of the Minneapolis – St. Paul highway system for both rush hour and non-rush hour time intervals, and validate the extracted network weight matrix. The results of the modeling indi- cate: (1) the spatial weight matrix is unstable over time-of-day, while the network weight matrix is robust in all cases and (2) the performance of the network weight matrix in non-rush hour traffic regimes is significantly better than rush hour traffic regimes. The results of the validation show the network weight matrix outperforms the traditional way of capturing spatial dependency between traffic links. Averaging over all traffic links and time, this superiority is about 13.2% in rush hour and 15.3% in non-rush hour, when only the 1st -order neighboring links are embedded in modeling. Aside from the superiority in forecasting, a remarkable capability of the network weight matrix is its stability and robustness over time, which is not observed in spatial weight matrix. In addition, this study proposes a naïve two-step algorithm to search and identify the best look-back time win- dow for upstream links. We indicate the best look-back time window depends on the travel time between two study detectors, and it varies by time-of-day and traffic link. Municipal governments worldwide have been pursuing transit-oriented development (TOD) strategies in order to increase transit ridership, curb traffic congestion, and rejuvenate urban neighborhoods. In many cities, however, development of planned sites around transit stations has been close to non-existent, due to, among other reasons, a lack of coordination between transit investments and land use at the regional scale. Furthermore, the ability to access transit differs from the ability to access destinations that people care about. Reframing transit-oriented development as accessibility-oriented development (AOD) can aid the process of creating functional connections between neighborhoods and the rest of the region, and maximize benefits from transport investments. AOD is a strategy that balances accessibility to employment and the labor force in order to foster an environment conducive to development. AOD areas are thus defined as having higher than average accessibility to employment opportunities and/or the labor force; such accessibility levels are expected to increase the quality of life of residents living in these areas by reducing their commute time and encouraging faster economic development. To quantify the benefits of AOD, accessibility to employment and the labor force are calculated in the Greater Toronto and Hamilton Area, Canada in 2001 and 2011. Cross-sectional and temporal regressions are then performed to predict average commute times and development occurring in AOD areas and across the region. Results show that AOD neighborhoods with high accessibility to jobs and low accessibility to the labor force have the lowest commute times in the region, while the relationship also holds for changes in average commute time between the studied time periods. In addition, both accessibility to jobs and accessibility to the labor force are associated with changes in development, as areas with high accessibility to jobs and the labor force attract more development. In order to realize the full benefits of planned transit investments, planning professionals and policy makers alike should therefore leverage accessibility as a tool to direct development in their cities, and concentrate on developing neighbourhoods with an AOD approach in mind. One of the major causes of social exclusion for people with developmental disability (PDD) is the inability to access different activities due to inadequate transportation services. This research paper identifies transportation needs, and reasons for unmet, but desired untaken trips of adults with developmental disabilities in Hennepin County, Minnesota. We hypothesize that PDD cannot make trips they want to make due to personal and neighborhood characteristics. A survey measuring existing travel behavior and unmet transportation needs of PDD (N=114) was conducted. The survey included both demographic and attitudinal questions as well as a travel diary to record both actual and desired but untaken trips. Logistic regression analyses were conducted to determine reasons associated with their inability to make desired, but untaken trips. Most respondents did not live independently. More than half of the surveyed population worked every day and recreation trips occurred at least once a week for about two-thirds of the population. About 46 percent were unable to make trips they needed to make. Public transit posed physical and intellectual difficulties, however the presence of public transit in neighborhoods decreased odds of not making trips. Concerns about Paratransit services were also reported. Findings from this study can be of value to transportation engineers and planners interested in shedding light on the needs of a marginalized group that is rarely studied and have special transport needs that should be met to ensure their social inclusion in society.